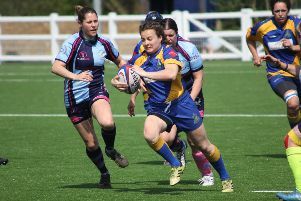 Kenilworth Ladies’ superb cup run ended in a heavy defeat to Supermarine Ladies in the final at Cheshunt RFC on Saturday, writes Sophie Freestone. However, disappointment turned to delight moments after the match when Kenilworth were informed of their promotion to Women’s Championship Midlands Two for next season. Speaking to Glasshouse TV after the match, the side’s number eight, Caroline Spence, described how proud she was of her team’s achievements despite defeat to a side playing two divisions above them: “The result didn’t go our way today but we went out there and played our hearts out. “Coming runners-up having only started three years ago, I’m so proud of what we’ve achieved. We never let our heads drop and we really played the ‘Kenilworth Way’. Despite conceding an early try, Kenilworth responded well to score one of their own through Sophie Henry who raced up the left to touch down. Supermarine then crossed the whitewash a further three times in the opening 40, including an interception following significant Kenilworth pressure in their 22. Leading 26-5 at the break, the Wiltshire side scored two quickfire tries after the restart to extend their advantage to 33 points. 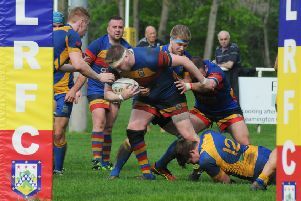 Another three tries in a ten-minute spell took the score to 57-5 before excellent defence from Kenilworth kept their opposition at bay for the final 15 minutes. Despite the defeat it has been superb season for Kenilworth who have tasted defeat just once in 14 league games. Head coach Tim Burden then ensured it would be a day to remember when he told his side of their promotion success. “Being promoted is the best possible news,” added Spence. “While we didn’t win the cup, we’ve been promoted to Championship 2 so it’s a really great day for us. Looking ahead to next season, which will see Kenilworth in the same division as Old Leamingtonians, Spence acknowledged her side would have to prepare well during the off-season. “We’ve got a lot of hard work and preparation to do over the summer. “I think we just need to get to next season, settle in, find our feet, see how we get on and try to make our mark in that league.